1 of 3 Trim asparagus. Cook 3 minutes in boiling water. Toss with oil and black pepper. 2 of 3 Cut slices of prosciutto in half lengthwise. 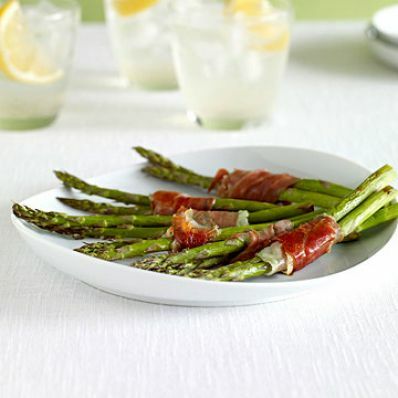 Roll up 2 asparagus spears in prosciutto half; transfer to a baking sheet. Repeat with all asparagus and prosciutto. 3 of 3 Bake at 425 degrees F for 15 minutes.